Amusements with FreeCAD: Finally we have arcs that work! There a sudden moments that make you realise that perhaps there is an easier way, just like last night. I though of mimicking the previous code that generates SVG directly. 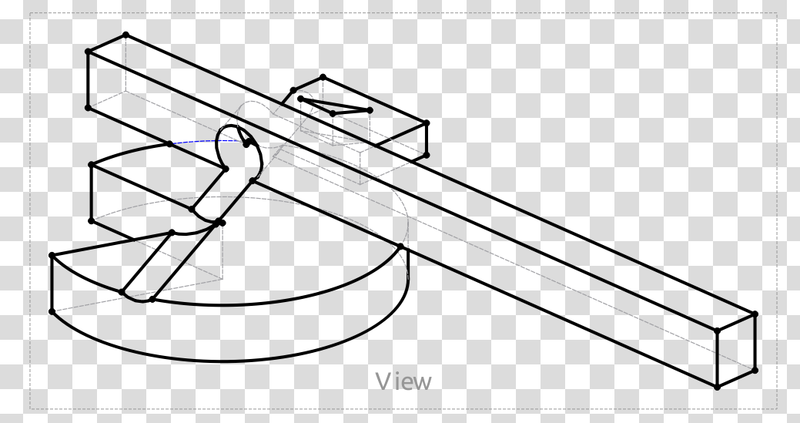 Instead of creating an actual ellipse arc, an cubic arc is produced instead - see the Mozilla Docs.For Qt to render SVG it must process this, so that there must be a method for drawing these somewhere. After some searching I found a function available in qsvg/qsvghandler.cpp. This had what I desperately needed and thanks to Opensource is possible. Literally copy and pasting the relevant code - later will be re factored to be simplified if possible, this morning I got it working and produced the results I was craving! This accomplishment crowns the ending of my Easter Vacation. I return to University tomorrow. The couple of bigs tasks remaining are growing smaller. Ideally, I need the drawing to update automatically by itself, but changes don't propagate into non-3d views. Also we need working templates - looked at by Joshua. The other is re-doing the export code - we get .svg and .pdf free with QGraphicsView, but .dxf.One thing I am going to enquire is an export to librecad. dxf sounds like the devil, so I think promoting an open format would go well. The remainder should be smaller jobs that other people could get involved with. By then I hope I could get this be ready for testing by mid-summer. Congrats, this looks just perfect.... I agree totally that now that you have a working projection system, the rest should be very small work. Can't wait to have something we canstar tplaying with! That's great Luke, can't wait to test that out!